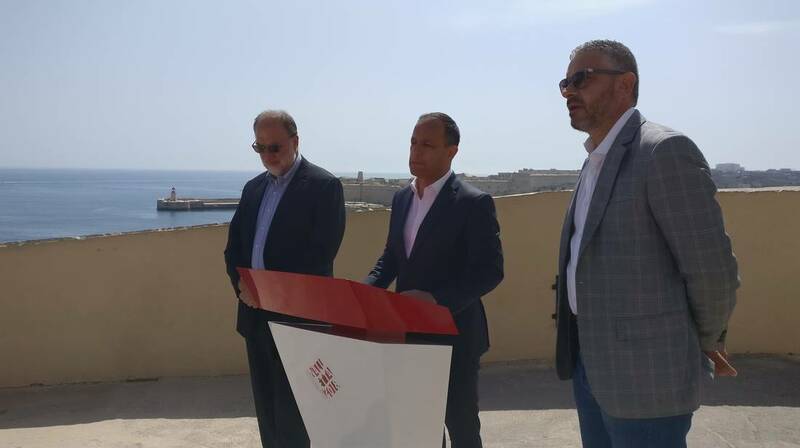 Mario Philip Azzopardi, Artistic Director Special Events, Jason Micallef, Chairman of the Valletta 2018 Foundation and Antoine Farrugia, Production Manager during this morning's press conference. La Fura Dels Baus will put up a spectacular show, as they return to Malta with a new choreography for the Valletta Pageant of the Seas. The latter debuted in Malta during the European Capital of Culture opening celebrations in Valletta, where they put up a grand show at Triton Square. The narrative is inspired by the relationship that exists between the Maltese and the sea, and will come to life thanks to Maltese participants who have worked hand in hand with the Barcelona-based group. The group’s philosophy is centred around redefining spaces by using non-conventional ones; a quality which will emerge during the show in the Grand Harbour. The programme for this year’s edition of the Valletta Pageant of the Seas, which is also part of the Valletta 2018 Cultural Programme, spans throughout the afternoon and evening of the public holiday, hosting fun sport activities by day, and colourful celebrations by night. During the Valletta Pageant of the Seas, the Grand Harbour will see a record-breaking fireworks ball. The ball, produced by the Żurrieq St Catherine’s Fireworks Factory, has a diameter of 53 inches, breaking the national record currently held by the 38-inch one done two years ago by the same fireworks factory, which had caught the attention of tourists and press all over Europe. This ball will be part of a larger pyrotechnic show consisting of aerial fireworks as well as fireworks rigged in the water and synchronised with music, with the participation of the Qormi St George’s Fireworks Factory and the Qrendi Independent Fireworks Factory. Apart from the fireworks show, after sundown the Grand Harbour will be animated with projections on a water curtain, a pageant of more than twenty sailing boats decorated with flags and fairy lights, and a preview of the upcoming original musical opera Aħna Refuġjati. A number of competitive races will also be held on the day. The general public is invited to take part in L-Għawma Toni Bajada; a swimming activity which will see participants swim across the Grand Harbour from Fort St Angelo towards Valletta. This swim celebrates the legendary figure of Toni Bajada – a historical figure who was known to relay important information he managed to gather from the Ottomans to the Knights, by swimming between St Angelo and St Elmo during the Great Siege of Malta. Those interested in taking part are invited to register themselves on the day at 16.00 at Barriera Wharf, next to the old fish market (Il-Pixkerija). A regatta will also be happening, during which both Maltese and international rowers will be racing in a triangle from the Old Customs House to Ras Ħanżir and back. The winning team will receive the Palju de Vallette; a black banner designed by Antoine Farrugia, adorned with baroque decorations representing each of the seven districts and boats taking part in the regatta. More than 20 participants will be using their creativity to create their own rafts which will be raced in Tellieqa Telliqun; a fun race consisting of rafts created using various recycled materials, without the help of motors or oars, while twelve Chaudron powerboats will also be presenting their own choreography in the Grand Harbour. Although the show will be visible from many areas around the Grand Harbour, the public is encouraged to watch from Valletta. Roads between Evans Building and Crucifix Hill (next to Valletta Waterfront) will be closed for traffic (except for residents) between Thursday 7th June 9AM and Friday 8th June 1AM. During the event, the press may access photos via this link: https://www.flickr.com/photos/[email protected]/albums/72157667213802357 Kindly note that when using these images, photographer must be given credit.